This trendy Barcelona apartment is situated in the quirky El Born neighbourhood of Barcelona. Here you will find a number of great bars, cafés and restaurants, as well as numerous supermarkets and the popular Santa Caterina Market. This area is well connected to other areas of the city by public transport, including bus and metro. The Estació De França train station is also just a few minutes walk away from this apartment, meaning you´ll always be well connected to the rest of Barcelona, Catalonia and beyond. This apartment has a total of three bedrooms and one bathroom. Two bedrooms feature a double bed each and the other features one single bed, meaning this apartment can sleep up to five people. The apartment itself is bright and modern throughout. 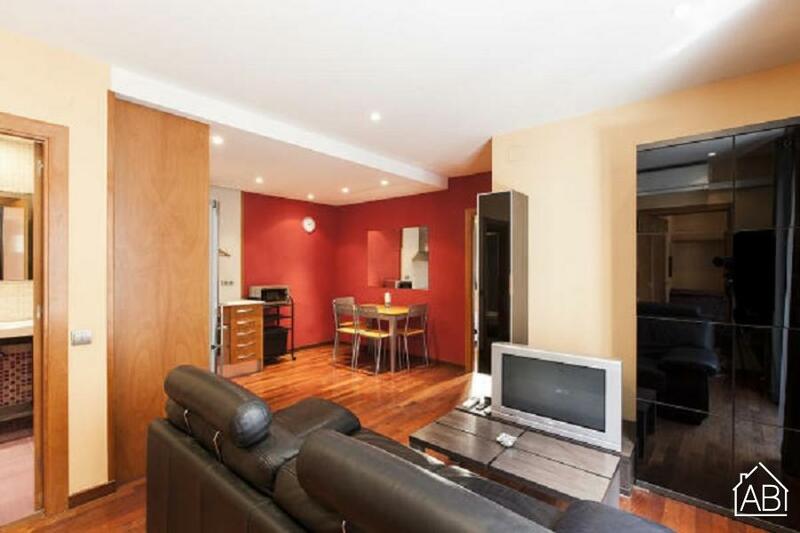 It has a private balcony overlooking a typical El Born street. The modern kitchen is fully equipped with everything you could possibly need, including a coffee maker and a kettle. Stay connected with this apartment’s Internet connection and TV. This apartment is also equipped with its own washing machine and dishwasher for your convenience. Complete with air conditioning and heating, this stylish apartment is the perfect Barcelona home at any time of the year.